CES: iLuv will debut the iLuv i399 iPod speaker dock, which features an integrated Bluetooth enabled wireless music feature that’s good up to 300ft. 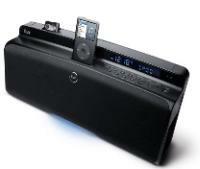 The i399 BluePin 2.1 Channel Hi-Fi Audio System is the first iLuv product to feature BluePin II technology. With the detachable BluePin II, users can listen to music on Bluetooth headphones or send music from another stereo Bluetooth device to the i399. The MSRP of the iLuv i399 is $229.99. The i399 is going to start shipping in February.